I know, I know, this is a little late. Life has been so hectic with between work and going through the process of buying a house, that I have been neglecting my poor little blog. 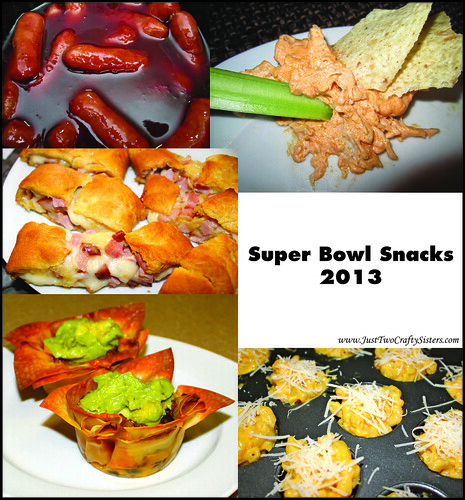 So, it is time to catch up, starting with our delicious spread from Super Bowl Sunday. 1. Spicy Little Smokies: This year we found out that Aidell’s make mini sausages and bought a double pack with chicken apple and spicy. We used the spicy only, but made the same simple sauce with grape jelly and chili sauce as last year. So Yummy! 2. Buffalo Chicken Cheese Dip: Same great dip as last year. In case you missed it before, here is the recipe. 3.Ham & Cheese Crescent Log: This ended being more of a lunch than an appetizer, but could be used as either. It was a recipe created out of what we had on hand, left over ham and sliced swiss cheese. Recipe coming soon! 4. Taco Cupcakes: Can I just say, these taco cupcakes were AMAZING! I cannot wait to share the recipe in the next few days. I mean, queso, meat, guacamole, yum! Click here for the recipe! 5. Mac & Cheese Bites: And finally, delicious little bites of cheesy goodness. I saw these on Pinterest months ago and patiently waited for the right moment to indulge. Click here for the recipe! So there you have it. A great afternoon of overindulging in yummy snacks while watching some football For more appetizer ideas, follow my Appetizer board on Pinterest!